I recognise the person walking towards me, but I can’t recall where from. We approach each other, the huge open-air foyer of The Cape Hotel catching the sea breeze just so. As he passes we make eye contact and I say hi. He says it back, his face shielded by a trucker’s cap and his voice deep and a little croaky. I’ve heard it before, in the movie Scream. I realise it’s David Arquette, and though I’m not that deeply embedded in celebrity culture, I still get a little rush. “Hace frio,” says the concierge as I approach, lamenting the ‘cold’ weather. It’s 21 degrees with a cloud or two in the sky. But this is a part of the world that glows with 350 days of sunshine per year. Warmth is its earmark. 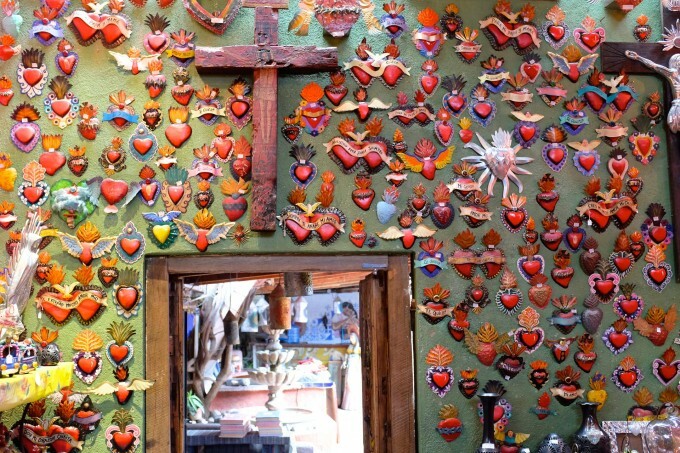 I’ve been to Mexico before; I’ve seen it’s huge sprawling capital city packed with hip neighbourhoods, the quaint streets of San Cristóbal De Las Casas, the tropical ruins of Palenque, the west coast hippie surfing haven of Puerto Escondido, the party at Playa Del Carmen and the culinary capital Oaxaca. I know Mexico has many faces, but touching down in Los Cabos – or Cabo as it’s known – still comes as a surprise. Comprising the very bottom tip of Mexico’s Baja Peninsula in the country’s west, Cabo is actually the all-encompassing name given to two distinct towns; the rowdy Cabo San Lucas, known as a backdrop for teen reality MTV series, and the more tranquil and arty old town of San José Del Cabo, with its hip restaurants and low-key vibe. The two towns are vastly different, and between them stretches a 30 kilometre ‘corridor’ hugging the ocean, full of oversized beach resorts in a variety of shades. 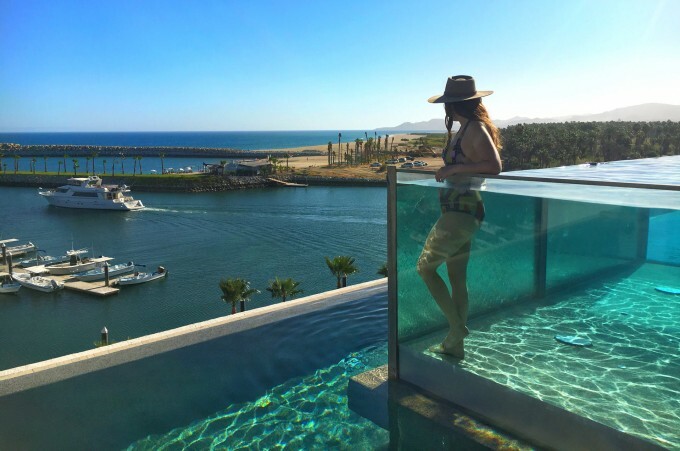 Getting to Cabo is a cinch – it’s just a two-hour flight south of LA, which may explain why it’s a veritable playground for celebrities. Reese Witherspoon was Instagramming her trip while we were there, and Zach Braff (along with his Scrubs co-star Donald Faison) and Jessica Simpson also recently visited The Cape Hotel where we spend two nights. 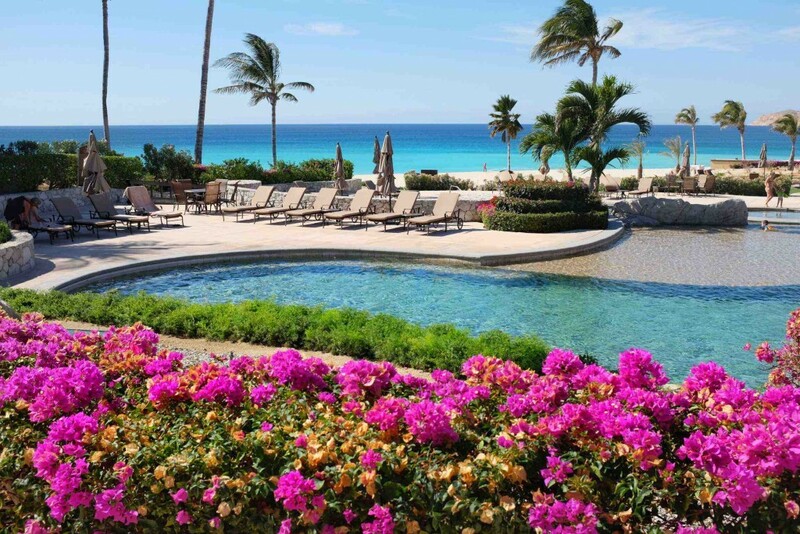 Oprah, George Clooney and Cindy Crawford all have houses in Cabo, too. 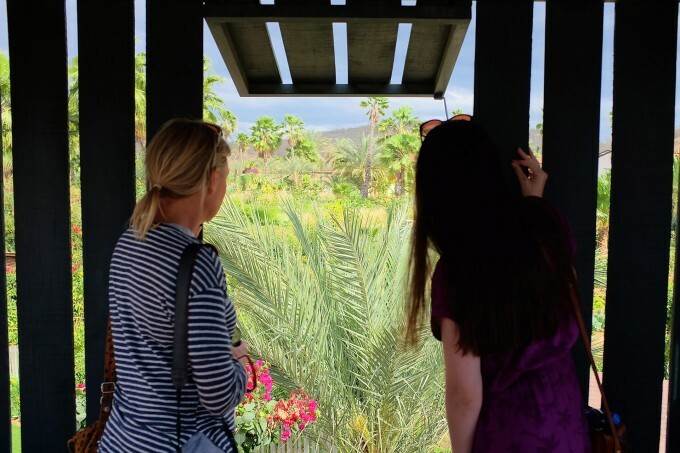 The place attracts celebrities, the ultra rich, and – yes – Spring Breakers, but the sheer option of things to do means you can have any kind of holiday you want in Cabo. 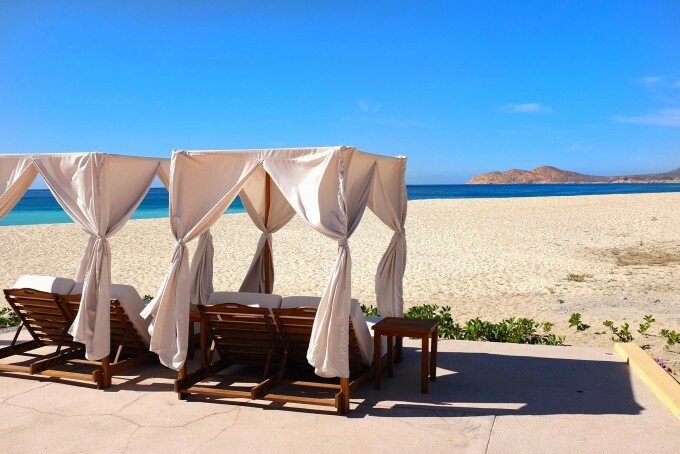 Whether it’s sipping mimosas by an opulent hotel pool, eating as much incredible food as your wallet and waistline can afford, partying all night at a super club or kayaking to a deserted beach, Cabo is a choose-your-own-adventure sort of place. On September 15, 2014, Cabo residents got news of a weather warning. By 9pm, Hurricane Odile – the most intense tropical cyclone to ever hit the Baja Peninsula – was tearing through the resort town, taking down houses, hotels and infrastructure in its wake. There was severe flooding, mass evacuations and widespread damage. It was a huge blow to the region, and its prime industry – tourism – slowed down as the massive cleanup effort began. Just two years on, though, and the echo of the storm that tore through the town is inaudible. The people were resilient – with many operators using the forced closures to renovate – and the rebuilding process was swift. 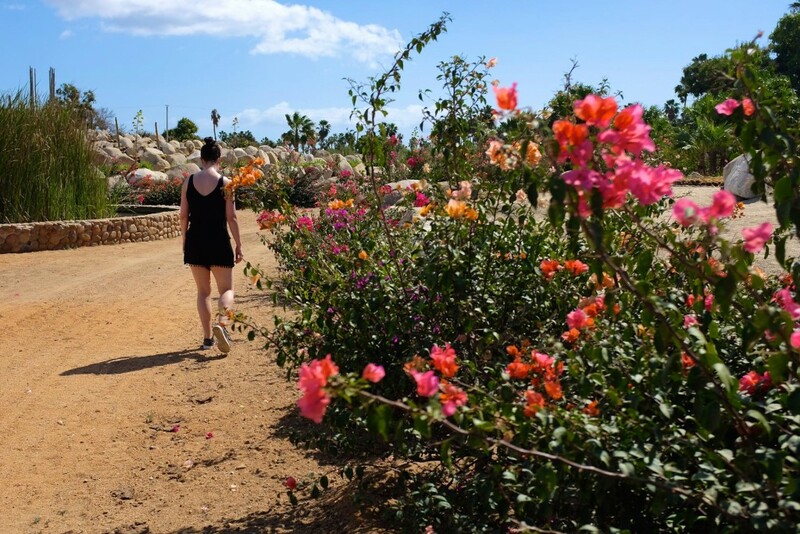 After all, Cabo itself is a place that emerged quickly; just 25-years-ago it was a remote fishing village with only one traffic light in town. Now, given its natural beauty and proximity to the sun-hungry travellers of the US, it’s fertile ground for hotels and tourism. 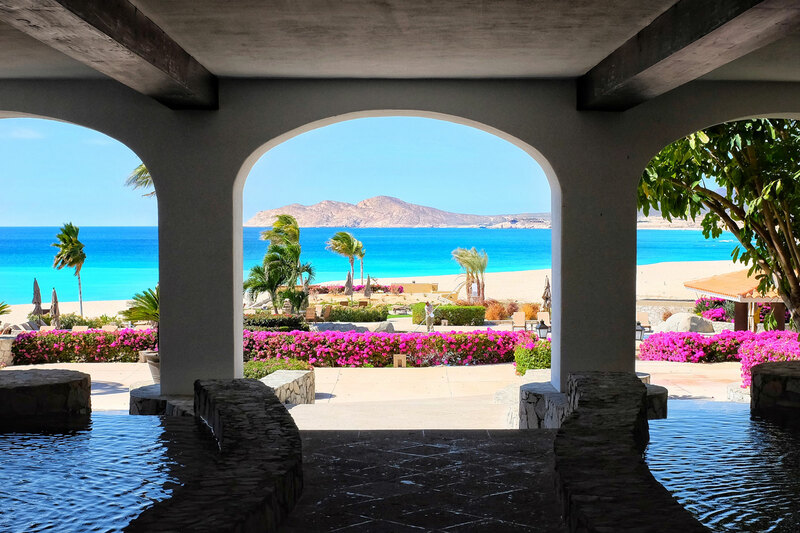 The obvious US influence means the place feels bicultural – you can pay in USD or Mexican Pesos, there’s a fair few American hotel chains and most people work in tourism and can speak English – but Cabo holds on to its original charm, specific to Mexico. The plane lands on a small strip in a teak desert that stretches to bald, brown mountains. The air is hot and dry as my retinas struggle to adjust to the brightness. Cacti stand sentry, reaching lazily for the cloudless blue sky. Palm Springs comes immediately to mind. A carpet of desert shrub covers everything and it seems to extend to eternity – until you drive west and a strip of shimmering cobalt rises to meet your eyes. It’s the Sea of Cortez. Say it aloud: the name even sounds amazing rolling off your tongue. 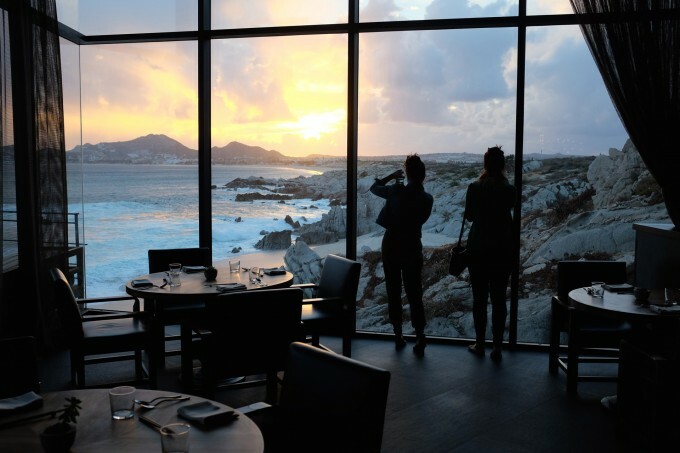 Cabo is one of the few places in the world where the desert meets the sea, and the juxtaposition is as brilliant as it is baffling. 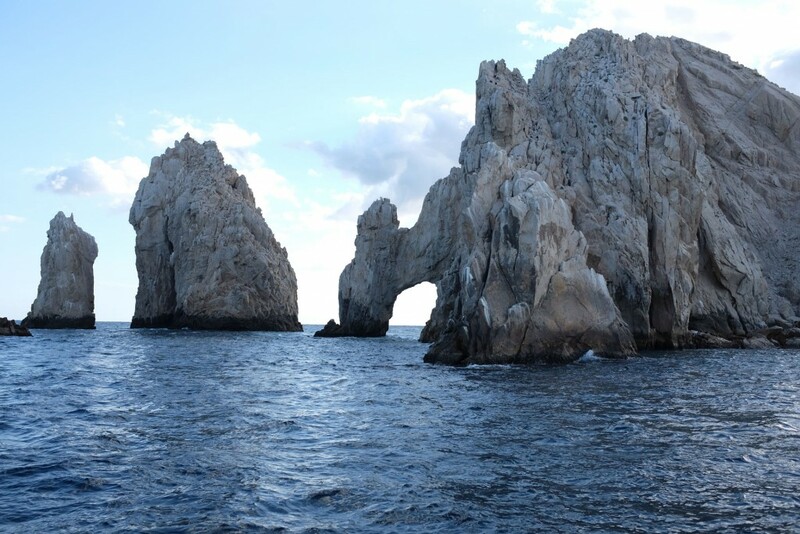 The hallmark view in Cabo is El Arco (The Arch). It’s a mass of rocks that juts out into the ocean separating two beaches – Lover’s Beach, swimmable and shielded by the Bay, and Divorce Beach, dangerous and with a dramatic wave break from the mighty Pacific. A lot of the beaches in Cabo aren’t swimmable due to this harsh break, but there are a number of bays and private beaches, reached by boat or kayak (try hiring from Tio Sports), where you can swim. I recommend finding one; the Sea of Cortez is silky, warm, and clear. 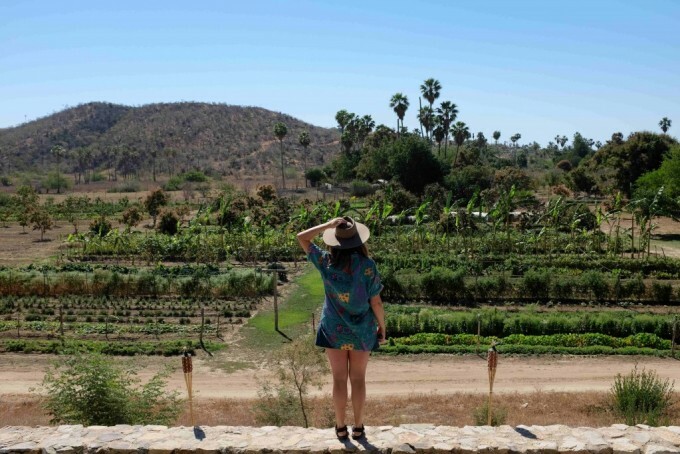 Back on land, I’m surprised to hear that, despite being a desert, Baja California has more organic farms than any other Mexican state. Underground water reserves feed these farms which dot the sparse landscape like grand oases. 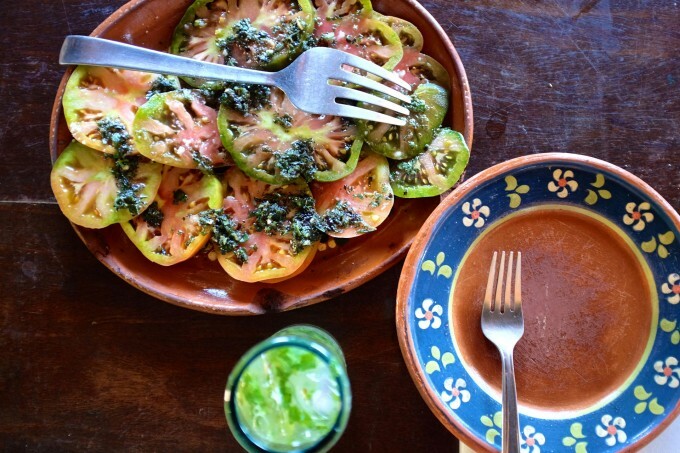 At Los Tamarindos organic farm, we wander the garden picking our own vegetables and sampling fresh herbs, their aromas haunting our hands. A local chef leads our group in preparing a traditional three-course Mexican meal and we happily consume the fruits of our labour. 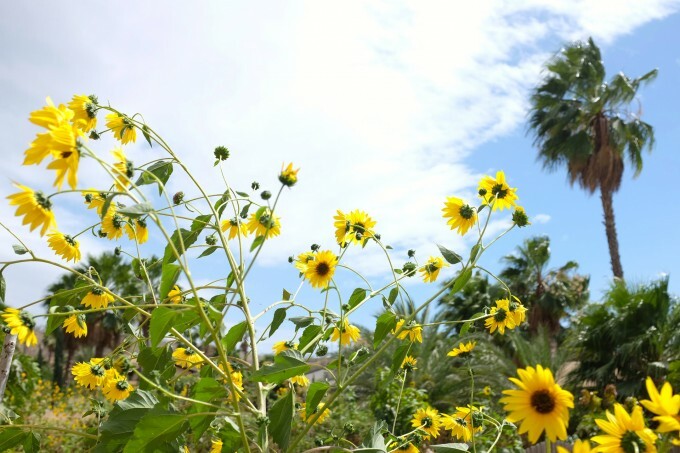 Nearby, the ultra hip Flora Farm is a mix of Eden and Alice In Wonderland; a romantic and extravagant green space, decorated with flowers, bales of hay, adopted stray dogs, swaying palm trees and buckets of freshly-picked vegetables. 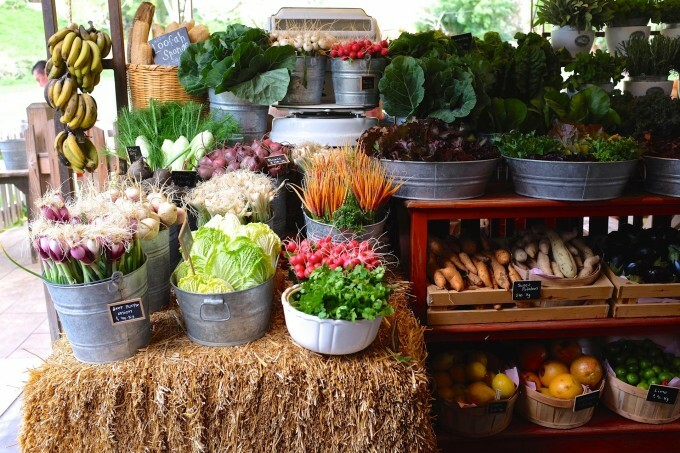 Along with a veggie farm, the sprawling grounds are home to residential cottages, a restaurant and bar, an art market, bespoke fashion and craft shops, an ice cream cart, a wine bar and a brewery. It’s a dream world, realised. It’s lush as hell. Plus, Adam Levine from Maroon 5 got married here, so you can probably impress someone back at home with that information. 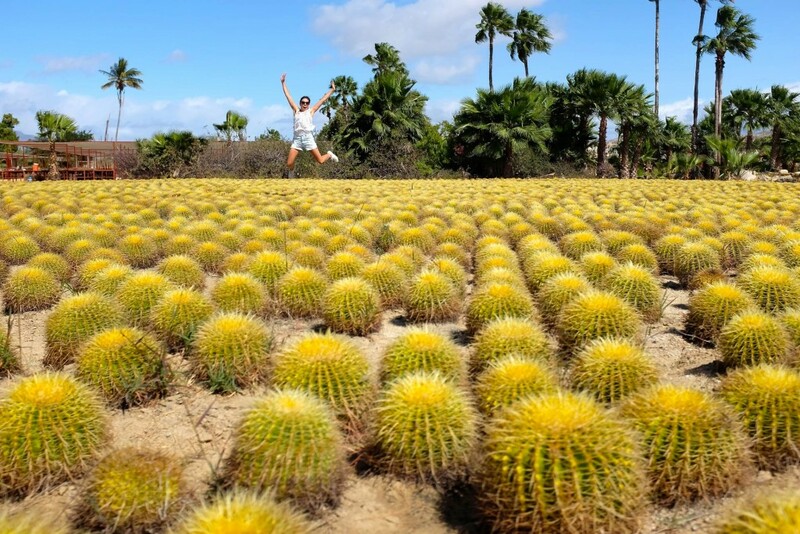 On the same side of town near San José, you can hire a bike (or guests can make use of the free ones on offer at Hotel El Ganzo) near the Marina and ride around to the Wirikuta Garden to see row upon row of manicured fields of cacti, begging to be photographed. In Mexico, Cancun is the college party and Cabo is the Met Gala. It prides itself on both its exclusivity and privacy, which is probably why celebrities flock there. It’s home to fancy, discrete resorts and probably more ‘Bali beds’ than Bali. For a sample of A-list celebrity life, stay at The Cape – the newest hotel in the resort corridor. It’s unfussy, with masculine touches; a dark, understated colour scheme, a stand-alone copper bath tub in each room, and a bed so wide you can’t touch both sides at the same time. 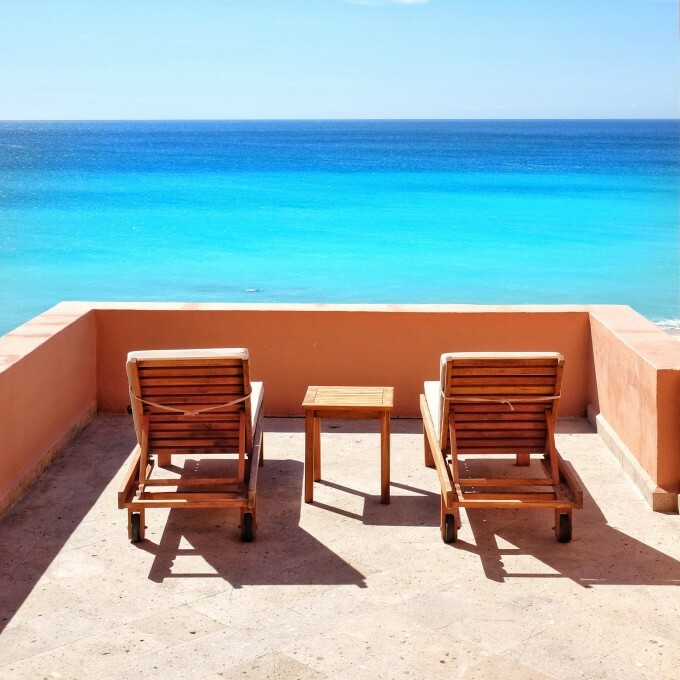 Overlooking a popular surf break, each room at The Cape faces out to the sea, offering arguably the best view of El Arco in town. 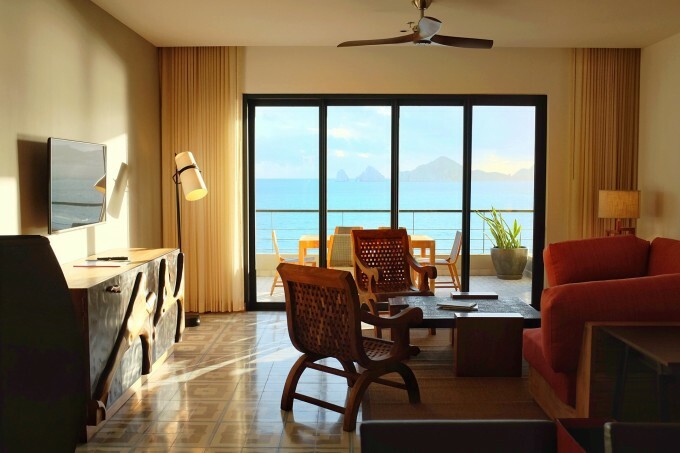 The hotel common areas – like the excellent Manta restaurant, the spa and the Glassbox Lounge – all have inky interiors with large windows or open-air spaces observing the ocean. It’s like a dark cinema, with the glorious spectacle of nature playing out on the screen. 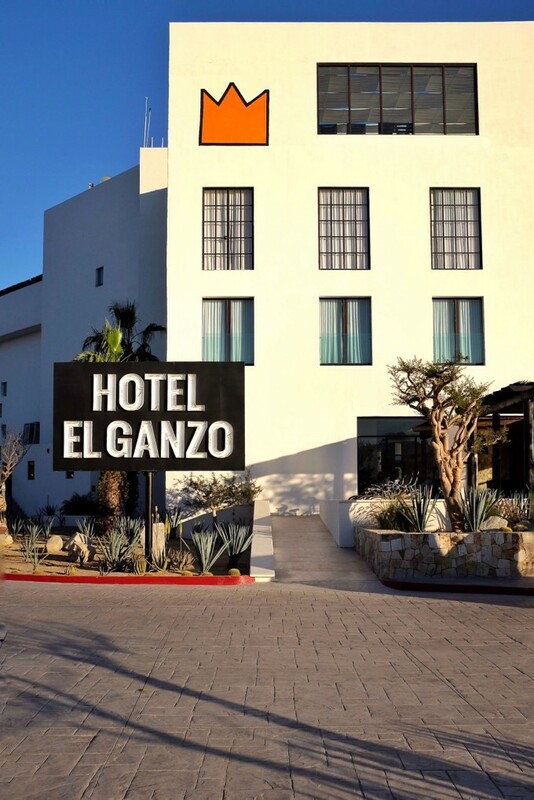 For the creative class, Hotel El Ganzo offer the coolest digs in the desert. The hotel’s white-wall aesthetic isn’t just for the airiness; the hotel invites artists to join them and create work in exchange for being hosted. The white walls are, in fact, a canvas. The idea is that one day, the hotel will be filled – a gigantic walk-in artwork. It’s a real-time project, and the hotel has two new installations from the time we check in to the time we leave. It’s not just art either; musicians can trade live guest-only rooftop shows for free stays and use of the professional recording studio underneath the lobby. The whole hotel is adults-only, and the rooftop infinity pool is (literally) on a whole other level. You won’t find anywhere else like it. 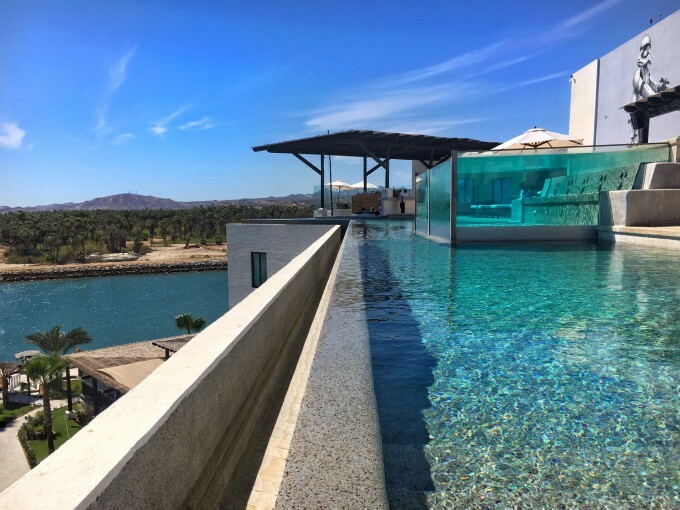 If you want to party, ME Cabo is a slick resort hemming a killer pool, all bleached out and brilliant against the blue sky and sea. 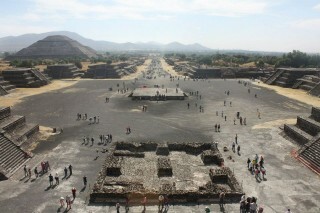 That said, it’s remarkably chill during our midday visit, especially for a place packed out with Spring Breakers. Maybe they’re hungover? But with a mimosa in hand, feet dangling in the water, it all feels pretty perfect. Save some cash to splash at Sunset da Mona Lisa where you can reserve a table or a personal enclave on a cliff edge jutting out over the sea. This place is seriously special. As the name suggests, head there as the sun descends to sip Prosecco and eat porcini-baked oysters. Prepare to witness at least one marriage proposal. 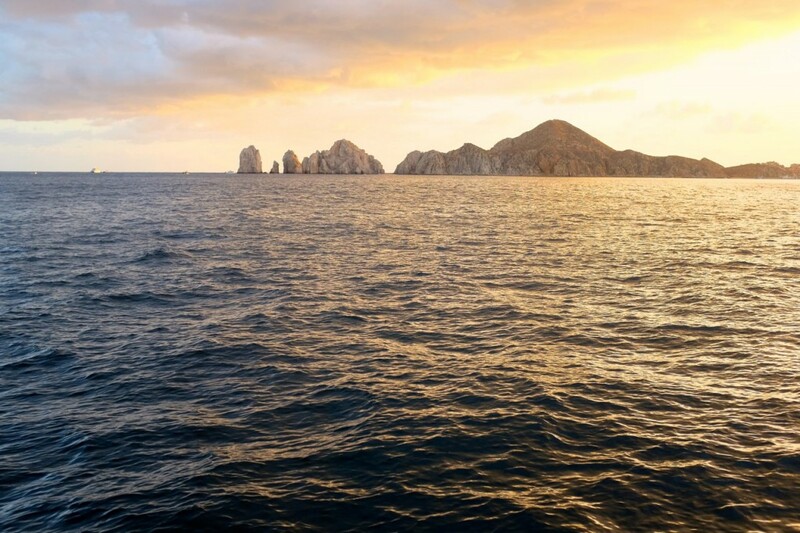 Out on the sea, a sunset yacht cruise with Cabo Adventures is a beautiful way to take in El Arco, and an emphatic exclamation mark at the end of the day. 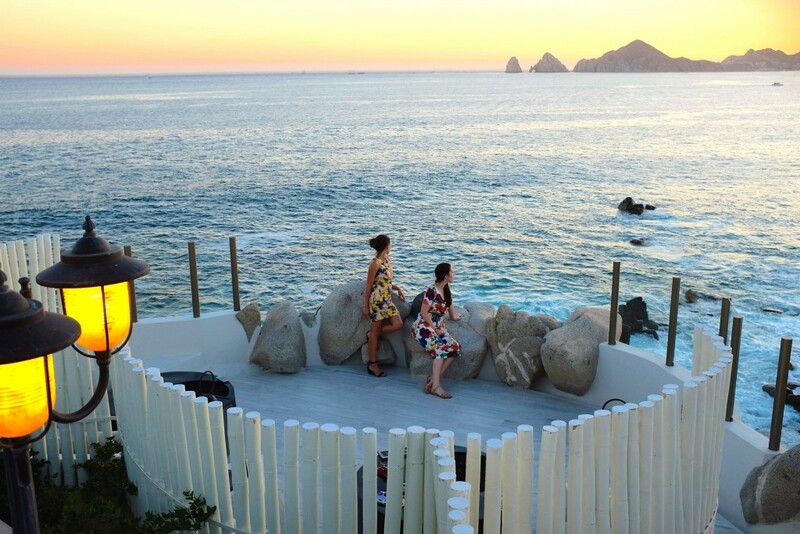 Despite the development of Cabo, Mexican charm exists in spades. 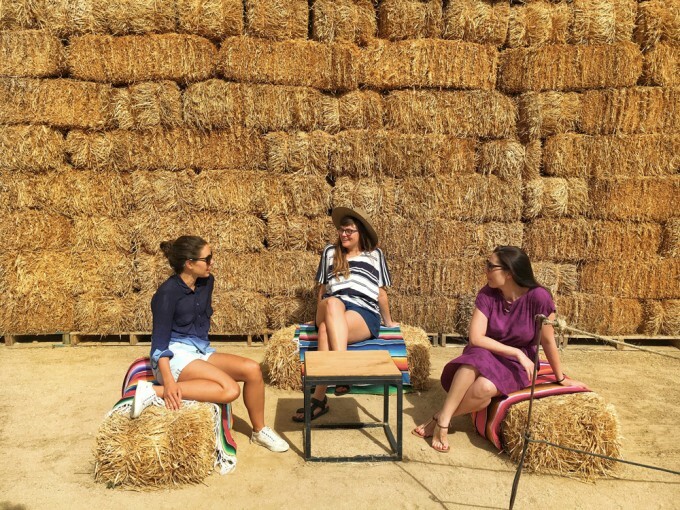 We found ourselves feasting on $2 tacos, attempting to haggle in broken Spanish, and watching teenagers practice traditional Mexican folk dancing in the San José town square. In Cabo San Lucas, the partying pulse of the area, collectivos (buses) plough through narrow backstreets, shop signs flash, and people call out to entice you into their shops, most selling mass-produced goods. If you’re after artisanal wares though, Mi Casa shop and restaurant is a sure bet, almost bursting at the seams with colourful trinkets to take home. Curios Carmela in San Jose is also great – a huge space full of reasonably-priced, mostly-authentic crafted goods. You’ll notice the beautiful glasses and tumblers with colourful rims almost everywhere you go. 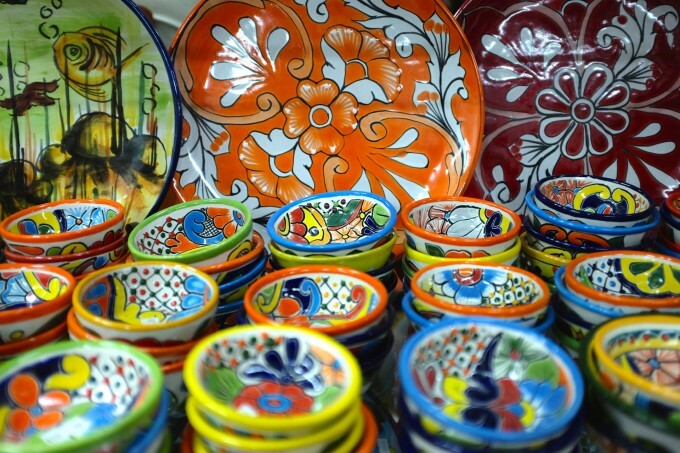 Most shops sell them, but for the best bargain and a quick lesson in the wonder of glass-blowing, visit the Artesanos factory direct where you can custom order glassware to collect the next day. Las Guacamayas is a restaurant packed half with locals and half with tourists. 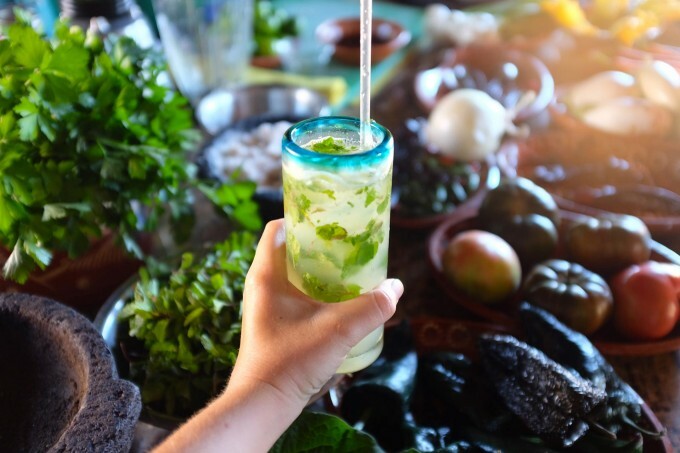 It’s lively and fun, with a thatched roof, plastic tablecloths, wall murals of the restaurant’s eponymous tropical birds (a guacamaya is a macaw), and a colourful dining courtyard arranged around a huge fairy-lit tree. 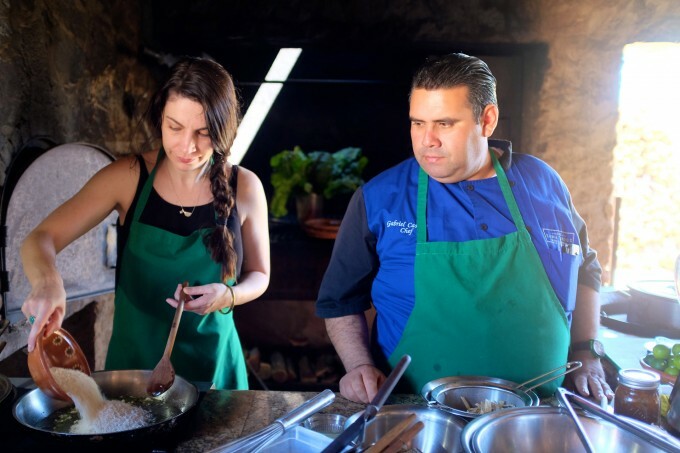 The menu includes cactus tacos, black corn fungus and tacos al pastor made the traditional way, with charred spit-grilled pork topped with a chunk of pineapple, diced onions and coriander. It’s cheap and cheerful, and most importantly, delicious. La Playa Marina is another local hit; just around the corner from Hotel El Ganzo, they serve us four fresh clams, guacamole, chips, and three beers for just $8AUD. 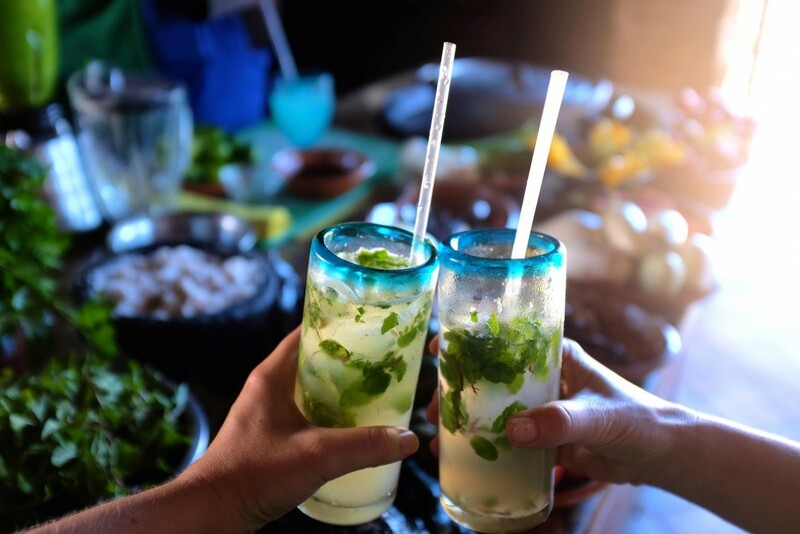 For a slightly more upscale version of traditional Mexican food, Los Tres Gallos in Cabo San Lucas serves special recipes prepared with love, passed down from the owner’s grandmother in a beautiful outdoor setting. 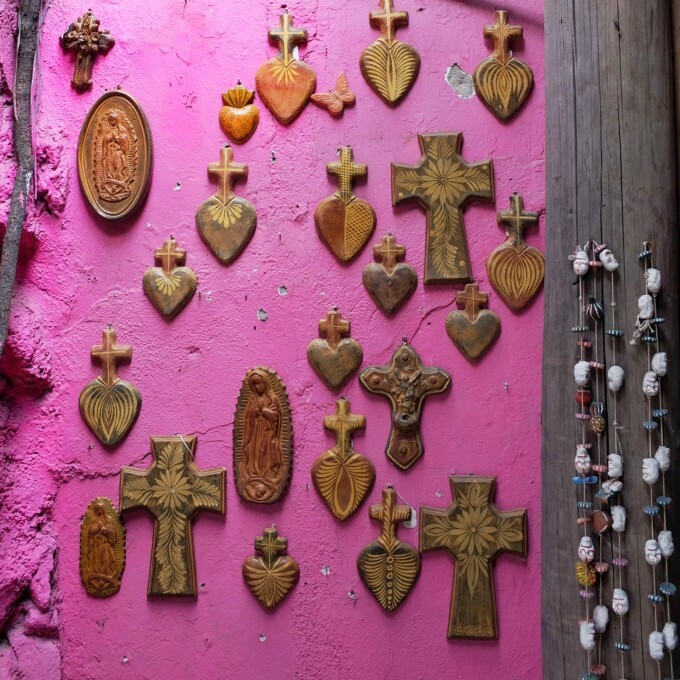 Of the many faces of Mexico, Cabo is the one that surprises me the most. It’s easy to be cynical about places where tourism is the main industry. 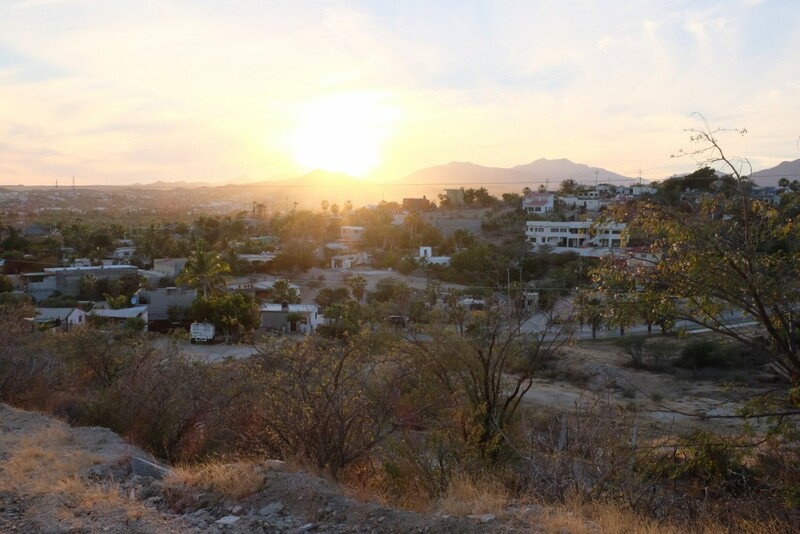 We assume real life gets lost – but that’s not the case in Cabo. As I make my way through the two towns, finding equal measures of luxury and everyday life, I find so much to appreciate. Everything feels good there, in the desert, beside the sea. 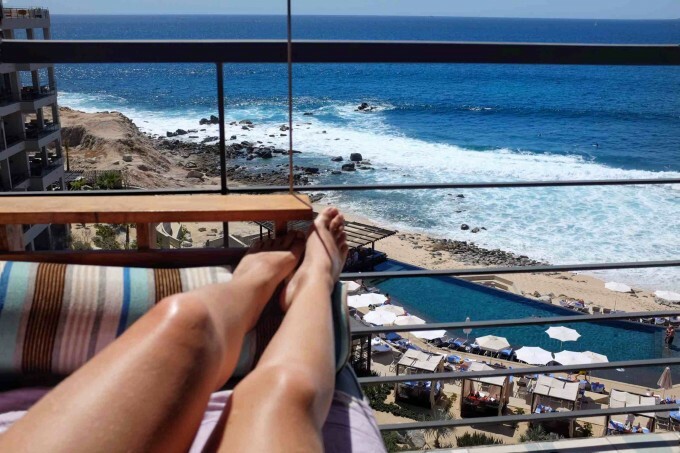 The memory of Cabo is something to fold up and keep safe; I take it out when I need some sunshine – when I need to feel warm. Cabo is just a two hour flight south of LA.